I’m a breakfast at any time of day sort of girl. Of course a lazy weekend affair with the papers and bottomless cups of coffee is my preferred option, but a frazzled Monday night supper will also do just fine. However, neither of those occasions call for a bowl of muesli. Oh no. I like a cooked breakfast, a cheesy French omelette, baked eggs, a full english, or the king of breakfasts… a breakfast sandwich. All the good stuff, between two slices of crunchy-but soft-bread, oozing all over the place. That is my jam, as they say. 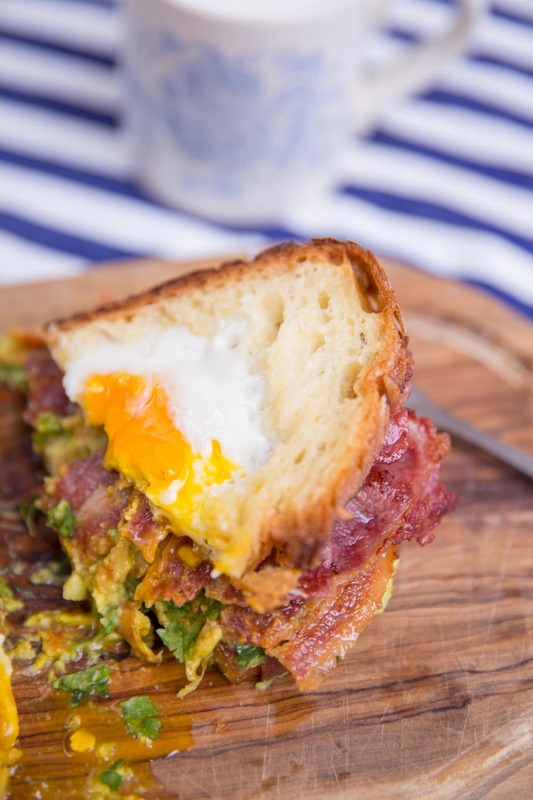 Now, breakfast sandwiches may be taking the world’s restaurant menus by storm… but in my opinion the very best one is the one you make at home. Pyjamas on, sleeves rolled up, slurping a cuppa as you go. Pop some music on and start by frying your bacon on a medium/high heat. Meanwhile smush your avocado, lemon juice, pinch of salt and coriander in a bowl. Prep your bread by using a wine glass to carve a hole out of one side of each sandwich. Take the perfectly cooked bacon out of the pan and place to one side. Toast your bread in the pan and crack an egg into the hole. The bottom side (with no egg) will cook faster, so while the egg finished off take it out. Smother in guac and a healthy amount of hot sauce or ketchup. And your egg in a hole. Step back and admire your handy work. Be sure to include the left over “hole” of bread, for yolk dipping. How you tackle your creation is entirely upto you. Two hands, or half it first so the egg runs all over the place. Keep some napkins on hand and maybe don’t tackle this on a first date, unless you want them to fall head over heels immediately! Don’t go bacon any hearts now.